Kolossal Games has now turned out several successful Kickstarter campaigns, always delivering high a quality end product. Funded in less than a day, All Manor of Evil is their most recent (and current) project. In All Manor of Evil players take on the role of thieves each with a secret agenda, pilfering and stealing ancient lovecraftian relics. Place the manor board in the middle of the table. If playing with 5 or 6 players, place the vault extension next to the manor board. 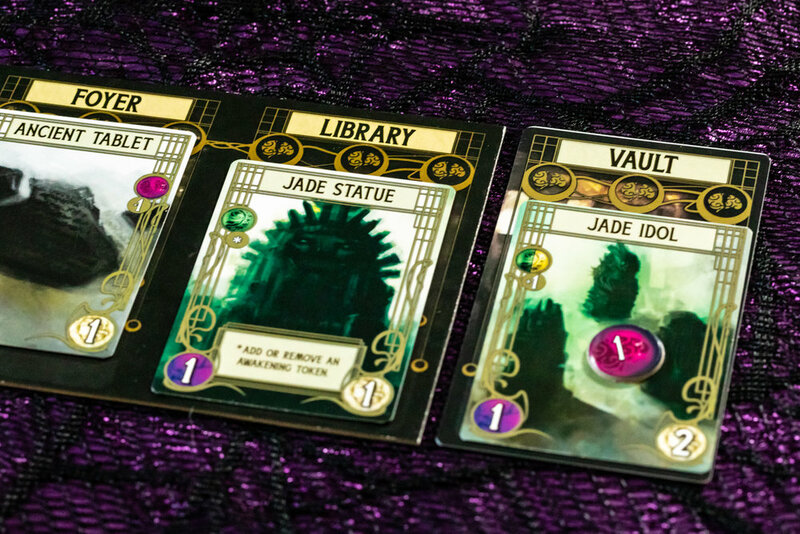 Choose one elder god of each color and place them above the manor board. Place one awakening token on each god. Remove the clock cards, action cards and skeleton keys from the deck. Shuffle the remaining cards and divide the deck into 4 equal piles. shuffle the two clock cards into one of the piles and place that pile next to the manor board. Place the other 3 piles on top in any order you choose. Reveal and place one card from the deck in each room of the manor board. Add 1 card to the vault if playing with 5 or 6 players. Choose a first player and give them the lantern token. Give the first players and the player to their left 2 madness tokens. All other players receive one madness token. Give each player a skeleton key as the first card of their cache. Give each player one of each action card. Give each player one role card, facedown so that only that player may see their role. Select Actions: Each player simultaneously selects an action card from their hand and places it facedown in their play area. When an action is played, the action card from the previous round is returned to the player’s hand. Resolve Actions: All players simultaneously reveal their selected action cards. All players who selected the same action card as another player receive one madness token. The player who selected the action card with the lowest initiative number resolves their action card first. 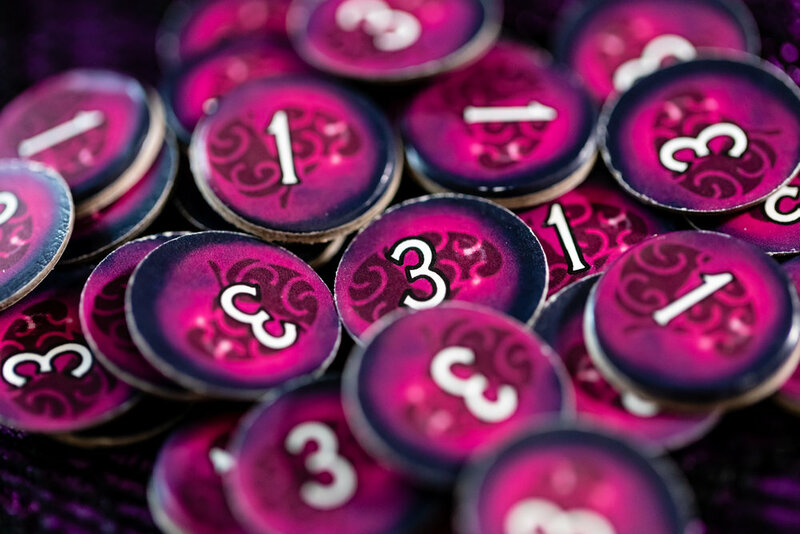 If tied, players resolve their action card in clockwise order starting at the lantern token. Repeat this process in ascending initiative order until all players have resolved their action cards. End of Round: Proceed to End Game if any gods have 6 or more awakening tokens on them. Otherwise, refill all empty rooms with the top card of the deck. Pass the lantern token clockwise and begin a new round. Start with the action ability at the top of the card followed by the room ability at the bottom of the card. Room abilities require the player to steal a card from one of the rooms listed if able. In a 5 or 6 player game, the vault is always available to steal from. All of the action cards in the game require the players to steal from either a room in the manor or the top of the manor deck. Stolen cards are added face up to the top of the player’s cache so that only the most recent card may be seen. When a player adds a relic to the cache as the result of an ability containing the word “steal” they must resolve the ability on that relic. Relic abilities may cause you to add or remove awakening tokens from elder gods, gain madness and/or use a written ability. The vault is treated like a normal room that players can steal from regardless of which action they choose. Any time the vault is empty immediately add a new card to it off the top of the deck and add a madness token to it. The second clock card is revealed: The game ends immediately as soon as the second clock card is revealed. Players reveal their role cards and resolve any game end effect associated with the second clock being revealed. Players total the madness value of all cards in their cache and the madness tokens they posses - The player(s) with the greatest total are devoured and lose the game immediately. All remaining players total the $ value of the relics in their cache and by resolving any scoring effects on their role card. The player with the most $ wins. In a tie the player with the least amount of madness wins. One elder god is awakened: Resolve any Reveal effect on the awakened god. Players reveal their role card and resolve any any Reveal effects on their role cards. Resolve any awakened effects on the awakened god. Resolve any madness effects on the awakened god. Players total the madness value of all cards in their cache and the madness tokens they posses - The player(s) with the greatest total are devoured and lose the game immediately. All remaining players total the $ value of the relics in their cache and by resolving any scoring effects on their role card. The player with the most $ wins. In a tie the player with the least amount of madness wins. More than one elder god is awakened: All players lose the game. With this copy of the game being a prototype I don't want to speak too much to the quality of the components. Historically Kolossal Games has always delivered a high quality product and I’m sure this one will be no different. I enjoyed the art on the artifact and god cards. It is shadowy and sinister which suits the theme of the game. I like the effect they achieved by not going for super crisp images. The original copy I had of the rules needed some work. I'm happy to see the document was updated today eliminating a lot of the rulings that caused confusion on my first read through. Once I familiarized myself with the rules I was able to clearly explain the game from start to finish in under 5 minutes with very few questions being asked by first time players. The box says the game takes 15-30 minutes which is probably true for most play throughs however it does have the potential to take a bit longer. The game can end fairly quickly by summoning an elder god however a clock card end game takes a little bit more time. I haven't had an opportunity to play a 5 or 6 player game, but the addition of the vault room could potentially speed up the game as more cards would be revealed/acquired per round. Although simple, the game does have some strategy to it that even a first time gamer would be able to appreciate. The secret role cards help you to plan for the type of end game you will most benefit from while also forcing you to make some tactical decisions when choosing your actions or stealing from a room. The various player objectives cause somewhat of a tug of war between players in multiple different aspects of the game like adding or removing awakening tokens and giving other players madness. I wasn't sure how I felt about eliminating players but since this only happens at the end of the game it's not a huge deal for me. The possibility of elimination requires you to be more strategic about how much madness you receive which is an added challenge that I appreciated. I enjoyed playing with 4+ players because the elder gods then have awakening abilities that devour more players for reasons other than madness which adds an even higher level of strategy to the game. 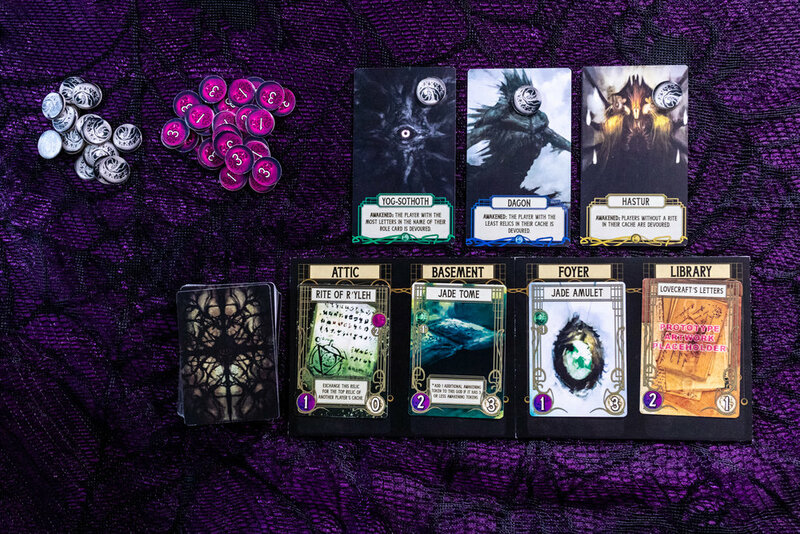 In a two player game, players take turns playing HP Lovecraft’s character at the end of each round. This is a minor inconvenience, however it takes a minuscule amount of time to play HP’s turn. I generally keep with giving HP the relics with highest madness and lowest monetary value to ensure there will be no contest at the end of the game. HP’s role card does has potential to squash your plans, luckily certain relics can allow you to view another players role card. The game does come with rules for solo play as well if that is something you enjoy. We had lots of laughs playing this game as we watched the board state shift back and forth and almost come to an end for several consecutive rounds. Most players immediately requested a second or third back-to-back game. The quick and easy to explain instructions make it ideal for any play group, novice or experienced, that want to fit a quick game into their game nights. This game is well suited as a gateway game or for anyone who enjoys light-medium weight games. You can back this game on Kickstarter until November 16th 2018 at 12:59AM AST. All Manor of Evil is available at two different price points, $19 and $29. For the added $10 you receive an expansion, additional cards and acrylic tokens. In my opinion this is the way to go: replay-ability will be boosted tenfold. As always, thank you for reading. Leave your comments, questions or thoughts in the comment section below.